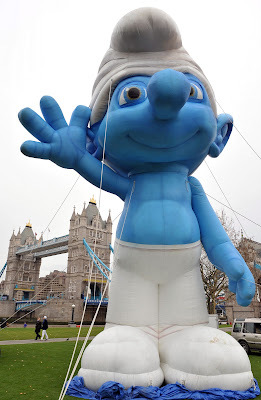 To promote the release of The Smurfs movie on DVD in the UK, the worlds largest inflatable Smurf visited Tower Bridge in London. I won't sully he moment with more words though, there's 40 ft. Smurf action to see. Okay, this is a clean blog, so I am not going to say what my gut reaction was. That is so cool and thank you ahead of time for the nightmares that I will be having tonight. That's Smurftastic! Why couldn't it have been that hot hot Smurfette? Those cold, staring eyes. The first person he actually gets alone under the cover of darkness...you know he's going to smurf the hell out of them. Don't go TS! It's what he wants. 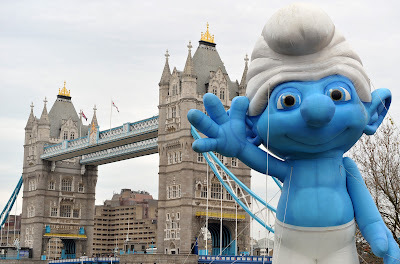 If you venture out to the bridge at this time of the year....you wouldn't need a giant smurf to bog you down...your colossal jacket would do the job better...he is kinda attractive.....Gosh, what happened to my taste in men/smurfs? I swear on my dark soul, this is the last comment for today...over from Alex's blog...actually I nominated you for the Gold movie 411 award and sent the link...sorry if they got it wrong. @Rek, The more profiles you follow with, the merrier. haha. Thanks for the nomination. I assure you, it's been a pleasure having you for an online friend. You have a very different sense of humor that appeals to me. Smurfaroo! That is one big smurf! I am your 300th follower! congrats! I agree with you...smurfs are all about the smallness and this GIGANTOR smurf flys in the face of their mighty blueness. I also see an 800 lb gorilla in the room. :) hey, made you blog of the week for the week. I hate all smurfs large and small. If I happened upon this giant, I'd have to find something sharp and deflate him into a pile of blue.